Larry Page’s Google business card, circa 1998 – Holy Kaw! Larry Page’s Google business card, circa 1998 – Holy Kaw!. This is bound to change the competition landscape for sure. 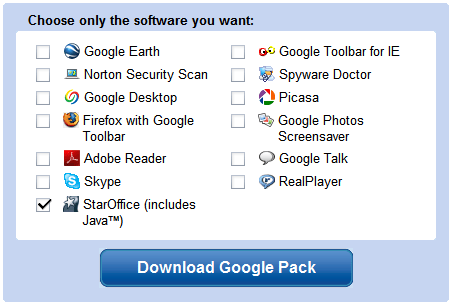 Google Pack, the collection of applications recommended by Google, includes a new software: StarOffice, an office suite developed by Sun. In 2000 Sun released StarOffice’s source code, which became the foundation of OpenOffice.org, an open source project sponsored by Sun. It is still in beta but has some nice features such as routing of your calls based upon your filters, gettting customized ringer-tone (for your callers). I have a couple GrandCentral invites to share. Leave a comment if you need one. Are you an online seller attending eBay Live! in Boston this week? If so, join us for a celebration of user choice at the Google Checkout Freedom Party on Thursday night (6/14). To get to the party, just hop on the classic Beantown trolley in front of the Boston Convention Center and follow the freedom trail to the Old South Meeting House. We’ll use the same spot where revolutionaries launched the Boston Tea Party to celebrate freedom with free food, free drinks, free live music — even free massages.